Vine has been gaining momentum ever since its launch in January, piggybacking on Twitter’s considerable user base and fast becoming the new social media darling amongst younger users. To this day, and despite the recent launch of arch-rival Facebook’s Instagram video sharing feature, it is showing no sign of abating. On the contrary, if anything Twitter promises us that with Vine ‘2.0’ soon in market this could well be the beginning of greater and bigger things to come. In terms of reach, the latest publicly available figures stand at 40M Viners worldwide (up from 13M in June), with an estimated 50K in Australia (source:@SMN_Australia, thanks David!). Now some of you may argue that’s a drop in the (South Pacific) ocean, hence not even worth considering as part of your marketing mix. I beg you to reconsider and here is why. Vine offers a unique, playful way to connect with your audience that drives differentiation for your brand. Vining has been described as a new ‘art form’ by Jack Dorsey, co-founder of Twitter, and rightly so. Simply, the 6-second videos (or Vines as they are known) are ‘little windows’ into your consumers and fans’ creative minds. Unlike Instagram’s ‘generous’ 15 seconds and various props (e.g. 13 filters, cinema mode etc. ), Vine’s time constraints and ‘raw’ approach to video creation truly put the power of your imagination to the test. The art of Vine-making is tricky to master as it requires you to be creative not only in the story you are telling but in its execution also – with only 6 secs to get your message across artfully. And so not surprisingly, the 6-second short-form video is particularly popular with the creative community, with some art directors specialising in Vine-making and advertising agencies using it as a tool for hiring creative staff. It actually takes skills to create something meaningful and beautiful at the same time, in such a limited amount of time – just have a go and see for yourself. The first Vines I saw were rather painful to watch, jerky and hard to comprehend at the best of times. However, as advertisers and Viners at large got the hang of it, the micro-video blogging network grew on me as did the quality of the content. 9 months later, it has turned out to be a great way for brands to seek participation from their fans. Successful examples of this abound in the US, where the adoption of Vine is the most prevalent amongst consumers and marketers. Famously, GE with its successful ongoing #6SecondScience projects; one of which can be seen here. And its #GravityDay campaign – the longest Vine chain ever to my knowledge – as sampled here. Other early adopters include Virgin Mobile USA with its #happyaccidents campaign and Airbnb which took Vine-making to a new level by inviting the audience to co-create the first short film entirely made of Vines. Vine may never reach the same scale as Instagram (with 10 times as many monthly users today); however I can foresee its community and loyal following building steadily over time. Vine-making is hard to master for a start and so when you do, you tend to stick to it. Simply, as a brand it gives you an edge (or USP) hard to compete with in your category. As a fan, teenager or aspiring creative, it makes you stand out amongst your friends or peers; it makes you feel good. The arrival of Vine on the market was timely for a number of reasons. Not only does it tap into our growing appetite for consuming and sharing visual content on social networks and on the go, it also gives advertisers a new tool to achieve cut-through on social media amongst the ever-increasing noise. As recently outlined by Ipsos, competition for ‘image attention’ has indeed never been greater as we hop from one screen to the next and back, and our senses get solicited all day long by hundreds of messages in different media formats. Vine is simply a great tool for creating attention-grabbing rich visual content and generating earned media amongst social media users. How critical is Vine to your social media marketing mix? GE’s CMO Beth Comstock admitted recently that social media had played a critical part in helping turn around the company’s fortunes. In her view, social media had helped make GE “relevant in a lot of new ways”. I recently became a fan of GE’s social media initiatives, and in particular of their marketing efforts on Vine, which I follow with great interest and amusement. For a company whom I never felt connected to in any way, and whose purpose and business were obscure to me to the say the least, through its own but also fans’ Vine videos, this once faceless corporation has managed to make itself likeable and its purpose tangible – in other words relevant to me. The performance metrics speak for themselves. At a glance, during that one-month period, we can see that Vine outperformed Instagram on both engagement rate and number of retweets. Further, according to Unruly’s research in May, 5 Vines get shared every second on Twitter. 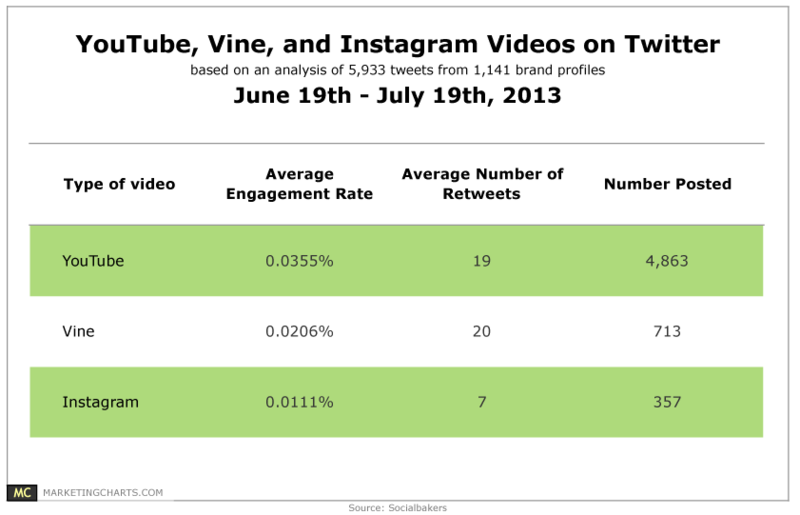 Together, these metrics clearly demonstrate how complementary Twitter and Vine are as engagement channels. If that’s not enough, what else does Vine have in its favour? Unless Facebook whose usage and appeal amongst millennials is declining, Twitter and by association Vine are still happily used by teens and 20-somethings (source: eMarketer May 2013). So if you have a substantial Twitter following and Gen Y’s are a key target audience, then it is worth trying Vine in a complimentary way to Twitter. Oh, and unlike Instagram, Vine will remain ad-free for the foreseeable future – which makes the user experience all the more immersive and attractive to social media users who are seeking to escape advertising-heavy networks (such as Facebook). So all considered, Vine makes for a brilliant opportunity to build a 1:1 relationship with your audience, in a space free of competitive noise. So come on, be brave, start SMALL but start experimenting NOW. Down Under or wherever you are.